Last week my start10 menu was suddenly empty, the left column for the Windows 7 and Modern Style is just blank. If i pick the Windows 10 style the start menu will show everything as usual. I've already tried reinstalling the program and also ran the bat file described here. Both things had no effect on the above issue. I'm at a loss on what to try next. Running Windows 10 build 1709, fully updated. Possibly your os has turn off its Recent items logging. Try to enable it back. That list should be rebuild as you use you apps again. Thank you for your quick input on this, i checked the settings and both "Show recently opened items in Jump Lists on Start or the taskbar" and "Show recently added apps" were On by default. I've gone ahead and turned both off and then back on again, after this the UWP app "Settings" suddenly appeared in the blank area. 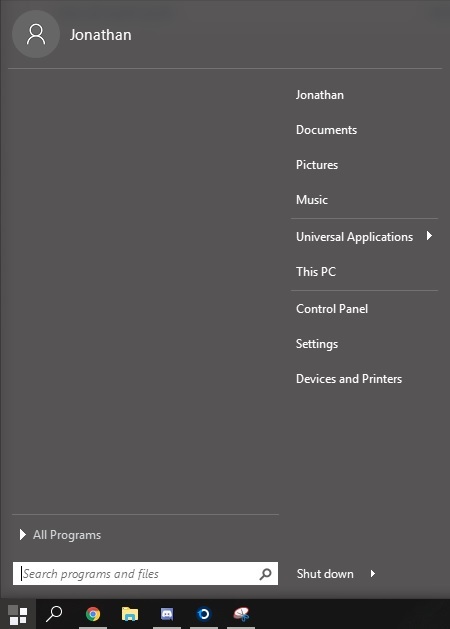 But unfortunately, nothing else is appearing when ran via the start menu. Yes i have, i have just done so again for good measure. Running the purge file was one of the first things i tried, i also ensured that i was installing the latest version (1.56) after that. I can do so again of course, i'll let you know how that works out. The 'Settings' UWP app is still there, just nothing is being added. Start Windows settings. Go to privacy, do you have let windows track app launches to improve Start and Search results disabled? You saved the day, that was it! Funnily enough i remember stumbling upon these options and thinking to myself, didn't i disable these when setting up Windows? Good lesson to read the things you're clicking instead of just blindly assuming.